The Cathedral at Notre Dame, a cultural, religious, literary (popularized by Victor Hugo’s The Hunchback of Notre Dame), and historic iconic landmark in Paris, has withstood plague, religious civil wars, revolutions, world wars, and occupation since construction began in 1163 C.E. 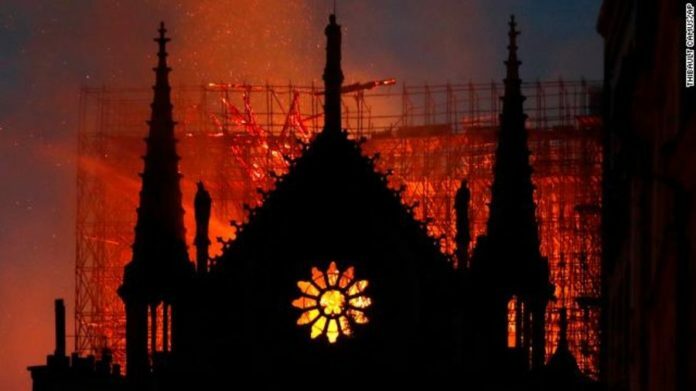 A beacon for Roman Catholics and tourists around the world, tragedy struck this Easter Week during the evening of April 15, 2019, when a fire broke out in the area of the cathedral undergoing renovations. 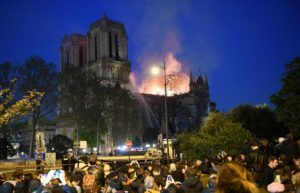 The famed spire has collapsed and fire destroyed two-thirds of the cathedral’s roof. Fortunately, French firefighters have indicated that the cathedral’s two towers are safe and salvaged many of the artworks (some of them taken out during the beginning phases of the renovation). Thankfully, no one perished in this incident although one firefighter is reportedly seriously injured.